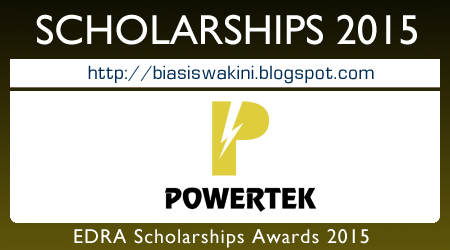 The Edra Scholarship Awards (previously known as Powertek Energy Scholarship Awards), is open to academically accomplished Malaysian students who require financial assistance to pursue their tertiary education in any discipline at public universities in Malaysia. EDRA GLOBAL ENERGY BERHAD (1102806-U) and its affiliates own and operate eleven power plants and have investments in two power plants across five countries, namely Malaysia, Egypt, Bangladesh, Pakistan and the United Arab Emirates with a total net generating capacity of 5,594 MW and a water desalination capacity of 16 MIGD. Applications for the 2015 academic year are now open. EDRA scholars are also provided with personal development training in the areas of leadership, communication, teamwork and creativity as well as working attachment in various departments within the Group during their study break in the first year. - Each award will be for the minimum period required to complete the course of study. Subject to the terms and conditions stated in the Scholarship Agreement. There is no bond attached to the Scholarship. However, as part of the Group's efforts to develop its human capital, scholars will be given preference in respect of employment opportunities within the Group upon their graduation. Applications are now open for the 2015 intake. 0 Komentar untuk "The Edra Scholarship Awards 2015"